Are you the type of rock fan that isn’t satisfied with simply listening to the radio? Sure, you enjoy it, but you want more. Do you look up the lyrics and wonder what they mean or if there is a story behind them? What on earth does “In-A-Gadda-Da-Vida” mean, anyway? We’ve got those answers for you in The Great Book of Rock Music! This book contains hundreds of riveting facts about your favorite rock songs. Do you want to know how your favorite group got together and who is really the brains behind the band? Whether you’re interested in what your favorite musicians like to do in their spare time, where they get the ideas for their music, or which artist had an exorcism in his home, you’re in for a treat. 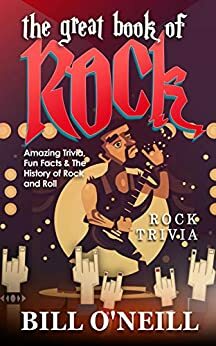 This book will satisfy your curiosity and help you impress your friends with your rock and roll knowledge. As easy to follow as a good drummer, this book will take you through the early years of rock and its development through the hippie era, the synthesizer-filled eighties, and the grunge age. You’ll read about dramatic, absolutely hilarious, and downright odd moments during the concerts that shaped music history and defined generations. Whether you’re a passive listener of your friend’s rock playlists or a connoisseur of guitar riffs, you’re sure to learn something new that will increase your enjoyment of your favorite music. For an extra challenge, try the quizzes at the end of each chapter. So go ahead, open the cover and enter the world of rock! 5.0 out of 5 stars‘With all that electrical equipment onstage, something is bound to happen sometimes—and it has’. The book is divided into fascinating sections – Back to the Beginning, The Superstars, The Bands, The Hits, Unforgetable Concerts, Awards and Broken Records, and Mad Miscellany. Each section offers tests to assure you remember the trivia! 5.0 out of 5 starsReally good trivia for R & R fans! As a life long fan of rock & roll, I found this book to be on par with other trivia books by Bill. The trivia is in some cases, revealing and surprising about a band or artist. I enjoyed reading through the book, and it was fun to go from one piece of trivia to the next. Wether you are a rock fan or not, this book is enjoyable, fun and a good read overall. Recommended. A gift for my son in law -- he seemed happy with it. Great book with a lot of fun facts and stories about rock. Would recommend.